Pre-publication review from Fathergeek.com, Sept. 2012. Gamer Geeks, this game is going to rip you a new one, in a good way! It is very challenging, engaging, and without mercy. The game play is not at all straightforward at first and the game has a steep learning curve. Once you figure out how to play it, however, the game still doesn’t become easy. The many different things a player can do, be they the nasty space creature or the hapless crew, is simply mind-boggling at times. The game does an outstanding job of challenging you and feels very rewarding when the game concludes, although you will feel winded. Indeed, the Gamer Geeks had to walk away several times from the table to just collect their thoughts as the game progressed. For those most elite of Gamer Geeks who enjoy a challenging 2-player experience, this game is sure to please. 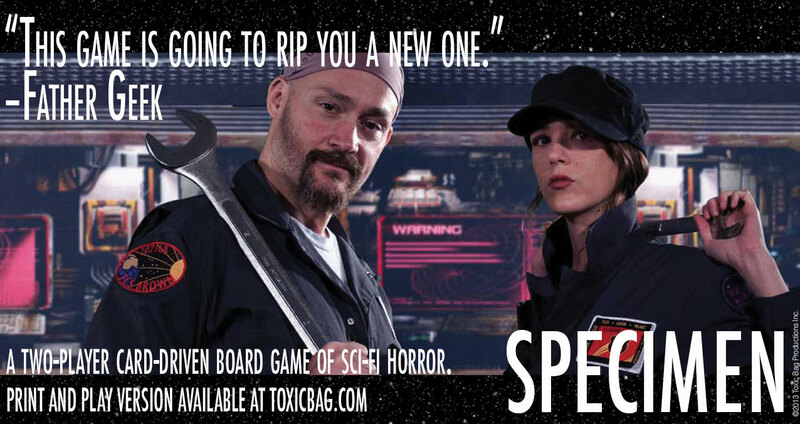 If you are looking for a horror Sci-Fi themed game for 2 players, where survival is based on cunning, strategy, and tactics (regardless if you are part of the crew or the creature hunting them), then do get your hands on Specimen.